Refuting foreign cultures, legal precedents, languages, and religions that are in opposition to Christianity. Introduction: While, in this day and age, it is difficult to see the United States as a nation under God, it was once commonplace for politicians to consult their Bibles, for children to pray openly in schools, for the Bible to be taught in public schools, and for the court system to reference the Bible for guidance. These times have passed. The 1960s brought rampant change to American society, and years since have struck even heavier blows to our nation’s Christian heritage. Something integral to our nation has been lost, and it must be found again if America is to endure as its founders envisioned. This discourse will primarily focus on the United State’s Christian roots by examining the beliefs and practices of its founding fathers, namely George Washington and Thomas Jefferson, among others. By examining the claims of Thomas Jefferson, in particular, we hope to shed some light on common misconceptions about the meaning of the phrase, “separation of church and state,” and its modern day implications. We will also look at the various ways our nation has fallen from its Christian heritage and how Christians can make a difference. In other words, Washington viewed religion and morality as essential to the success of the United States. Washington also spoke of religious devotion in his Thanksgiving Proclamation of 1789: “…[It] is the duty of all Nations to acknowledge the Providence of Almighty God, to obey His will, to be grateful for His benefits, and humbly to implore His protection and favor.” In fact, Washington’s relationship with God was so important to him, he set time aside twice a day every day of the week for prayer. He read from a collection of prayers, his personal journal, titled, “Daily Sacrifice.” Washington fully understood submission to God, and he practiced it daily, setting an example for all who knew him, as well as his fellow countrymen. He was a firm believer in the Christian theme of freedom. And although a strong Christian, he never imposed his beliefs on anyone. Rather, he “respected everyone’s faith as a sacred God-given personal trust.” Furthermore, he once said, “Every man, conducting himself as a good citizen and being accountable to God alone for his religious opinions, ought to be protected in worshipping the Deity according to the dictates of his conscience.” He believed so strongly that everyone was created equally and deserved freedom that he once said, “I hope someday or another, we shall become a storehouse and granary for the world.” And while it is true that Washington owned slaves, he was also the only Founding Father who set them all free. In fact, Washington treated his slaves better than most people in the 1700s. He refused to separate a family, and his slaves received the best treatment: healthy rations, opportunities for rest, education, and equal status. To Washington, slavery was an unfortunate necessity. He understood that it was wrong, but knew America was dependent on it; it was the only way to run a farm. Without slavery, the new nation’s economy would have crumbled. In order to understand what Jefferson meant by “the separation of church and state,” we must look at the First Amendment, which, in part, states, “Congress shall make no law respecting an establishment of religion or prohibiting the free exercise thereof.” Nowhere in the Amendment or any other founding document is found the phrase, “separation of church and state.” Yet, it often accompanies the First Amendment in courts of law. Clearly, it has been taken way out of context. Jefferson simply meant no single denomination should run the nation. He was determined to prevent what he called “the establishment of a particular form of Christianity.” Before the Revolution, the Church of England had taken its toll on the American colonies; the founders wanted nothing to do with another national denomination bearing ruthlessly over its citizens. But he did not mean the United States should not be founded upon and run according to God’s principles. Furthermore, David Barton writes, “The First Amendment never intended to separate Christian principles from government.” Jefferson first used the famous phrase on November 7, 1801, when the Baptists of Danbury, Connecticut, wrote to him in concern that the First Amendment suggested the government might one day try to control religious expression, since it seemed to declare “freedom of religion” as government-granted rather than God-granted. Realizing their concern, “Jefferson pointed out that there was a “wall of separation between church and state” to insure that the government would never interfere with religious activities,” yet this is precisely what has occurred. The United States was designed with a strong Christian foundation in mind. Even Thomas Jefferson felt that Christian principles should be put into government practice. In fact, the Founding Fathers believed that the United States could only function for the religious and moral, as John Adams once remarked, “We have no government armed with power capable of contending with human passions unbridled by morality and religion…Our constitution was made only for a moral and religious people.” David Barton also claims the Constitution was written for Godly people and that it isn’t working properly. The United State’s Christian heritage faces not only threats from inside but from around the globe, as well. In 2002, as a result of a 1998 treaty proposal by the United Nations, the first ever International Criminal Court (ICC) came into being. It was designed to serve as a platform for holding individuals accountable “for the most serious crimes of concern to the international community – genocide, war crimes and crimes against humanity, and, eventually, the crime of aggression.” As of July 2007, 104 countries have acceded to or ratified the statue; the United States, however, is not one of them. If the United States joins the ICC, Americans will have to submit to the judgment of foreign rulers who may not have Christian values. Therefore, it is best for the American judicial system to remain intact as it was erected by the Founding Fathers. It is essential that Americans protect and uphold the nation’s moral fiber by not becoming too involved with foreign countries that might be opposed to Christianity. If it’s not the Church’s calling to meddle in the affairs of the State, what can a Christian do to positively impact American society? The simplest but strongest answer is to live as Christ would have us live. We must share our faith and declare God’s goodness. Submit to His mighty rule! We don’t have to become politicians. We need only live like Christians. The worst thing Christians can do at a time like this is throw up their hands and surrender. According to George Grant, “Christian political and cultural involvement is merely an opportunity for us to express publicly our fealty to Him and our submission to His standards for life and godliness.” If we give up, we believe that God is not in control, that God is not the definitive ruler of all nations. In truth, “Nothing is immune from the rule of God.” Ultimately, we must declare Jesus as the Lord of the universe and not back down in spite of the persecution we will face. 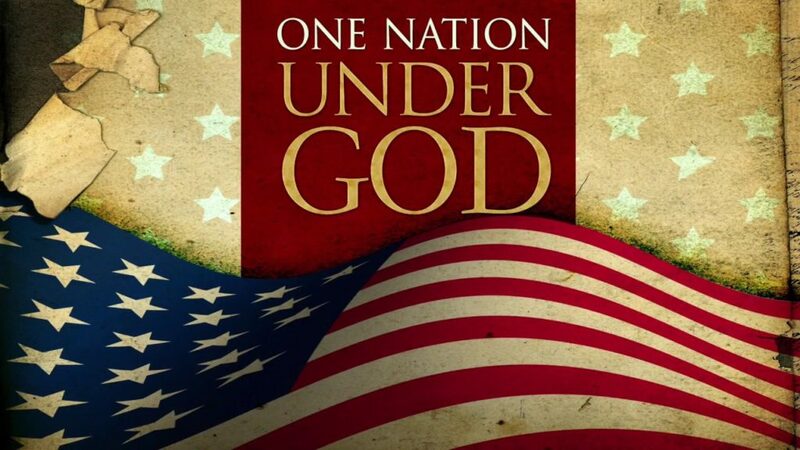 We must continue to proclaim, “In God we trust,” for He is the fountainhead of our free nation. David Barton, America’s Godly Heritage (Aledo: WallBuilder Press, 1993), 19. 2 Janice T. Connell, Faith of Our Founding Father: The Spiritual Journey of George Washington (New York: Hatherleigh Press, 2004), 175. David Barton, America’s Godly Heritage, 20. Joyce Appleby, Thomas Jefferson (New York: Times Books, 2003), 60. Adrienne Koch and William Peden, ed., The Life and Selected Writings of Thomas Jefferson (New York: The Modern Library, 1944), 567. David Barton, America’s Godly Heritage, 12. George Grant, The Changing of the Guard (Nashville: Broadman & Holman Publishers, 1995), 24. David Barton, America’s Godly Heritage, 14. Janet L. Folger, The Criminalization of Christianity (Sisters: Multnomah Publishers, 2005), 44. “The International Criminal Court.” United Nations Department of Public Information. http://www.un.org/News/facts/iccfact.htm (Accessed July 2, 2007). “1 July 2007: Fifth Anniversary of Rome Statute’s Entry Into Force.” Coalition for the International Criminal Court. http://www.iccnow.org/documents/1_july_2007_pr1.pdf (Accessed July 2, 2007). George Grant, The Changing of the Guard, 33.